Inevitably, the next series to appear was a sequel to the Elenium. It is set several years after the end of the Elenium, when Sparhawk is settling down to married life with Queen Ehlana. The first signs of trouble are some hints of a rebellion in his home Kingdom of Elenia, as well similar problems as some of the neighbouring Kingdoms. In addition, legends start to spring up of legendary heroes of past ages coming back to life, and inciting the local populace to revolt against their masters. Following a trail of clues seems to indicate that the problems may originate in the distant Tamul Empire – a vast country of several different races. Ehlana cunningly contrives a state visit to the figurehead Emperor Sarabian, and Sparhawk and assorted companions traipse off on a journey towards the Tamul capital. They discover that the problem of potential rebellion is much more acute in the Tamul Empire, and a vast conspiracy seems to be in operation – even reaching up to the higher levels of Tamul government. Naturally, there's also a supernatural element to it all, involving long-forgotten Gods, treacherous sorcerers and a mysterious race known as 'The Shining Ones' – whose mere touch will cause a normal human to dissolve. The first book, “Domes Of Fire”, sets the scene, possibly taking an unnecessarily long amount of time to do so with the result that it is a bit tedious. 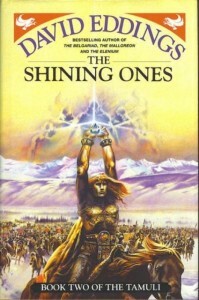 The second book, “The Shining Ones”, is the best of the trilogy as Sparhawk and friends start to get to the bottom of the conspiracy, and also encounter the unusual race that provides the title of the book, the Shining Ones themselves are probably the most interesting element of the series although ultimately they seem slightly peripheral to the main plot. The final book, “The Hidden City”, is marred by some unusual plot twists – such as randomly introducing Klael, a world-threatening superme bad guy in the last book of the series without any foreshadowing. The plot line is a lot less focused than in Eddings' other books and it feels a bit rushed at times. Eddings could be criticised in the past for the predictability of his plots, but The Hidden City seems to replace the predictability with some occasionally slightly bizarre plotting which is often unconvincing. The characterisation and writing are of roughly the same standard as other Eddings books – although “The Elenium” is probably better written overall. There are some memorable moments, but also quite a few moments that don’t really work, particularly in the final book. In summary, a patchy series with a slow first book, intriguing second book and rushed third book. Some interesting moments but not Eddings' best work.